Marc Pierre, Sanaa Kazi & Seth Hill in WHEN JANUARY FEELS LIKE SUMMER. Photo: A.R. Sinclair Photography. 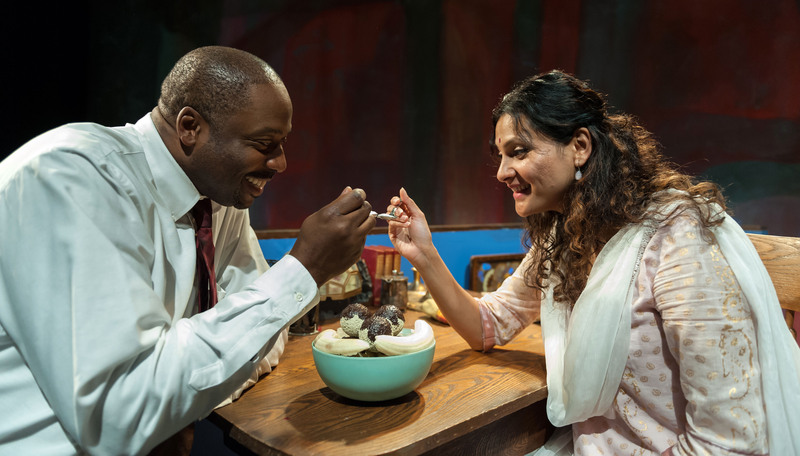 CAMBRIDGE – In this season of the relentless drumbeat of back-and-forth political accusations, the Underground Railway Theater has crafted a perfect antidote: A life-affirming, upbeat comedy about people finding love and companionship in the unlikeliest of places. Cori Thomas’ “When January Feels Like Summer,” a URT production at the Central Square Theater, is a light romantic comedy, a nice departure from some of the more serious fare the troupe performs, especially the science-themed shows. It is an unseasonably warm winter in Central Harlem, and that concerns Devaun (Boston University junior Seth Hill) and his good friend Leron (Marc Pierre), two young African-American men who count themselves as citizens of the world. That said, they are concerned about global warming that seems to be occurring that winter, and favor recycling as well as removing predators from the streets of their community. Indian-American Nirmala (Sanaa Kazi) came to America on an arranged marriage hoping to find love; instead, she found a loveless relationship that is left in limbo when her husband is shot. Despite her husband’s complete in attention to her, she faithfully keeps their small store running and has been visiting his hospital room for the three years he has been in a coma. She still considers herself married, reluctant to pull the plug. Her brother Ishan (Mesma Belsare), on the other hand, prods his sister to pull the plug – not for any altruistic reason — but because a piece of the million-dollar insurance policy can go to pay for his gender reassignment surgery. At first dressed in a suit and tie looking fully male, he appears in later scenes in the midst of the transformation, with long black hair and and tight-fitting woman’s clothing that accents a newly acquired figure. Ishan is now Indira, and as she begins his new life as a woman she decides to become a matchmaker of sorts, with her sister as the first customer. Who to match Nirmala with? Well, David J. Curtis’ Joe, an older African-American gentleman still recovering from a failed marriage, is an everyday guy in the New York City Sanitation Department, and he’s not above doing favors for Nirmala, such as bringing boxes of trash from the back room to the curb. He also mixes small talk with ice cream purchases. And while the cast is uniformly fine, the showiest parts and the major scene-stealing revolves around Hill’s Devaun and Pierre’s Jeron. They are not, to put it mildly, your archetypal urban youth, if indeed there is such a thing. They have low-end jobs at Burger King, but consider themselves guardians of their neighborhood. Devaun also has a charming habit of mangling the meaning of words, a Mrs. Malaprop, Norm Crosby-like habit that is both funny and endearing. Their youth hasn’t dimmed their confidence when it comes to charming the ladies – or for that matter, protecting their neighborhood from predators, including one they capture who has been assaulting the rectums of various residents. He is a villain and they are heroes made for cables news and the tabloid newspapers, and they bask in the fame and ponder how it may help them with women. 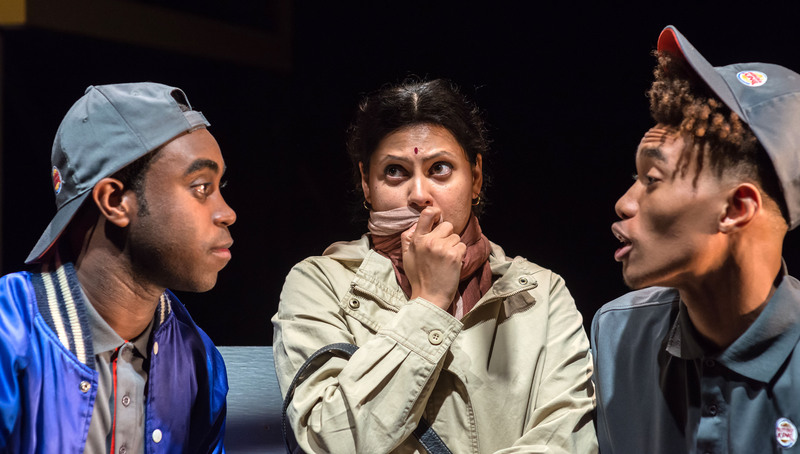 Devaun comes into Nirmala’s store to hang a poster and takes notice of Indira, the first male to really take notice of her since her transition. Thomas finds humor in the disparate personalities and cultures mixing – or in some cases — running headlong into each other. The courtships begin – a lonely Joe and a lonely, cautious Nirmala, still a virgin. Devaun and Indira, who is seeking guidance from her gods about how best to reveal to Devaun that her transformation into a woman isn’t quite complete. Even Jeron, who has been left out of the game for the most part, dips his toe into the water with a friend of Devaun’s after an hilariously unsuccessful beginning. “When January” is a series of small pleasures which, when added together, make for an uplifting, fun-filled night at the theater. Director Benny Sato Ambush is equally at home with high drama or low comedy and he is able to wring some fine performances from his cast, some of whom have limited experience, while keeping the tone as light, affable and upbeat as Thomas wrote it. “When January Feels Like Summer” is the perfect antidote to what at this point may be a terminal case of Election Fatigue. The Underground Railway Theater production of Cori Thomas’ “When January Feels Like Summer.” Directed by Benny Sato Ambush. At the Central Square Theatre through Nov. 13. centralsquaretheater.org. David J. Curtis and Mesma Belsaré in WHEN JANUARY FEELS LIKE SUMMER. Photo: A.R. Sinclair Photography.